Recent rains have left the city’s streets in terrible shape, as The Times shows in a photo taken at 1st Street and Spring. 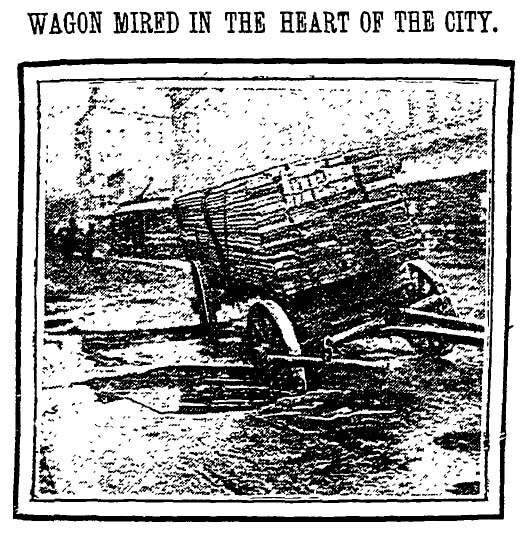 This wagon, pulled by a strong team, plunged up to its hubs in one of the potholes and the horses were unable to free it. “Under the whip and vociferous admonitions of their driver, they were helpless to pull it out from the stinking muck in which, hub deep, it stood,” The Times says. The driver abandoned the wagon, The Times says, posing an obstacle to all other traffic.